It's time to pack your suitcase...We speak to editor Nikola Kamien-Sarbinowski about the coolest surf town in Mexico, the best Northern hemisphere ski slopes and much more. How do you decide on the travel destinations for each issue of get lost? It’s a bit like a puzzle. As well as choosing emerging destinations we select a good geographical mix, different ways to travel (rail, cycling, sailing) and at least one story on an out-there location. The time of publication plays a role too; if it’s winter we like to transport our readers to somewhere warm, usually a beach or an island. Contrasting photography is essential too, so if two destinations look quite similar we’ll keep a story for a later issue. After more than a decade in print we’ve featured some pretty wild places, and if the chance to include somewhere rarely explored pops up we tend to get pretty excited. Why did you decide to make a special feature on Mexico for the July issue? The name Sayulita has been floating around the office for the past few years. We’d heard it was a cool little Mexican town where the surf was true, the fish tacos plentiful and the mood intoxicatingly low-key. So we had writer and photographer extraordinaire Flash Parker check to see if it lived up to our expectations. His response was “hell yeah”, and since then we’ve been itching to make it our cover story. It’s almost become an office obsession. Our publisher, Justin Jamieson even took his family there after reading Flash’s article, so it’s great to finally share it with our readers. 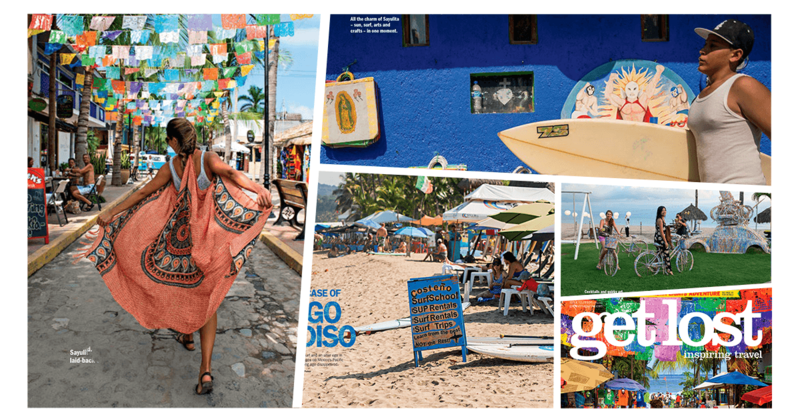 What are your top 3 tips for what to see or do in the coastal village, Sayulita? When is the best time of year to visit this Mexican seaside town? Go from mid-January through February when the weather’s just right, the surf isn’t too wild and there are fewer tourists from across the border. Rent your own boat and cruise out to the Marieta Islands to swim at a beach hidden within a cenote – a gaping hole in one of the islands – only open to travellers on certain days of the week. You might even see dolphins and whales en route. Back in Sayulita, organise a surf lesson with one of the locals and spend a day learning how to balance on the smaller, beginner-friendly break at the southern part of the beach. Then celebrate your progress with a frozen margarita as the sun sets. One of the feature articles in this issue draws on the comparison between Europe and North America and who has the best snow slopes. In this snow-showdown, which continent do you believe is winning the battle? North American ski resorts have so much going for them and the Rocky Mountains are among the most beautiful destinations in the world. But I can’t look past the quaint chalets, warming raclettes and raucous après-ski you’ll find on the slopes in Europe. Plus, there’s something about the language barrier that tickles my fancy too. In this feature, though, we ask our readers to choose their own winter champion. And it’s not just for the ski-obsessed either – we share the best ways to punctuate a week at the slopes with animal encounters, sleigh rides, hot springs and hearty food. For the foodie lovers, where do you suggest is the best country to travel to featured in the July issue for those obsessed with putting their taste buds to the test? Much is made of Mediterranean cuisine – Greece’s fresh mezze platters, Italy’s doughy delights and Spain’s rich morsels of tapas – but there are still some forgotten corners of this region that sit in plain sight yet have evaded the hungry tourist hordes. With its fusion of Greek, Italian and Turkish influences it’s a wonder Albania isn’t feted globally. Go now and you’ll find a country on the cusp of a gastronomical renaissance, with foreign-trained chefs returning to breathe new life into old classics. What is your favourite article featured in this months issue? This feels as though I have to choose a favourite child, except I don’t have any of those. For this issue I’d have to say it’s our Australian feature. Chloe Cann, our deputy editor, flew down to Tasmania for the opening of a new mountain biking retreat, and her story will make you want to jump on a set of wheels, stat. Think days cycling through mossy woodlands, exquisite local produce for every meal and nights spent glamping in timber pods tucked away in the bush. Knowing you've covered the most popular destinations for travel and everything in between, what do you think are the next upcoming hot spots for overseas travel?! South America has become increasingly popular over the past few years and it won’t be long until travellers start venturing beyond Chile, Brazil, Argentina and Peru’s Inca Trail. Take Ecuador, which boasts the Andes, the Amazon and the Galapagos all in one tiny country, it can’t stay under the radar for much longer. Australians are also beginning to realise there’s far more to Indonesia than Bali – it’s made of more than 17,000 islands, after all – so we’re going to see places like Flores popping up on Instagram more frequently. What can readers expect from future issues of get lost? Expect the unexpected. As an independent magazine we’re able to publish all manner of stories that wouldn’t make it to print in other mags. We’re always scouting for different destinations and new ways to explore the ones you already love. Some of the long form stories I’m especially excited to share include an overland adventure in Kyrgyzstan, a trip to the Faroe Islands, a wildlife adventure in Canada’s Northwest Territories and a Costa Rican road trip. If you fancy a free issue of the latest editon of get lost, simply be on of the first 25 people to enter your address details here! It's that easy. ON THIS DAY... in 1998 the Spice World movie premiered! ON THIS DAY... in 1992 when Prince Charles and Princess Diana formally announced their separation.